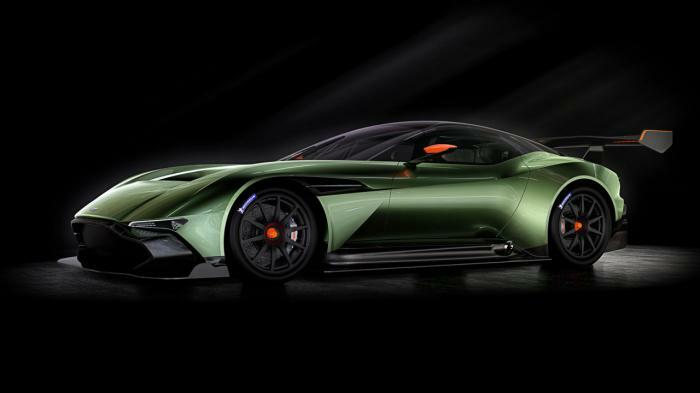 Aston Martin has officially unveiled the new Vulcan. Described as the brand's "most intense and exhilarating creation to date," the Vulcan is a track-only supercar that was designed to go head-to-head with the best cars in the world. Looking undeniably aggressive, the Vulcan has a unique front fascia with a massive grille that is integrated into the front splitter. That decision will likely provoke love-or-hate-it reactions but the rest of the car has a number of classic Aston Martin styling cues. Since the car was built for the track, it features a carbon fiber monocoque, a limited-slip differential and a magnesium torque tube with a carbon fiber propeller shaft. The model also has Brembo racing calipers with carbon ceramic racing discs that measure 380mm front and 360mm rear. Power is provided by a naturally-aspirated 7.0-liter V12 engine that produces more than 800 bhp (596 kW). Aston Martin was coy on detailed specifications but confirmed the engine is connected to a six-speed sequential transmission. The automaker also said the car has a power-to-weight that exceeds GTE race cars that compete in the FIA World Endurance Championship. Besides the almighty engine, the Vulcan has a bespoke suspension with adjustable dampers and adjustable anti-roll bars. There's also a variable traction control system and a driver-adjustable anti-lock braking system. Production will be limited to 24 units and buyers will be offered the opportunity to participate in an extensive track training program. As part of this, owners will receive instruction from experienced racers including Aston Martin Racing’s Darren Turner. They will also get behind the wheel of a number of high-performance models - including the V12 Vantage S, One-77 and Vantage GT4 race car - so they can gradually build experience and develop their track technique before taking their Vulcan for a spin.